All players know that a superstar on blue/purple arrow plays worse than an average player with yellow/red arrow. So what is the colour of the arrow determined by? Form? According to the explanation of Form, Form indicates the ability to maintain form when played regularly. So does a high form of 8 mean that the player will always have a green arrow or better? It seems to suggest so. Player with a form of 8, such as Xavi and Lahm, tends to have a green arrow or better for consecutive matches. Sure, they may suffer from blue or purple arrows at times, but this is similar to real life when players have a bad day. Players with a form of 5 or lower may find it hard to turn up for consecutive matches in yellow or red arrows. I also find that the form of the player, as in the colour of the arrow, improves after you win a match, and this gets better after winning consecutive matches. This reflects the reality where we witness teams suddenly go on a good run of form and destroy every team they meet. In the Master League, the player arrows will usually be green or better after you win a derby match. 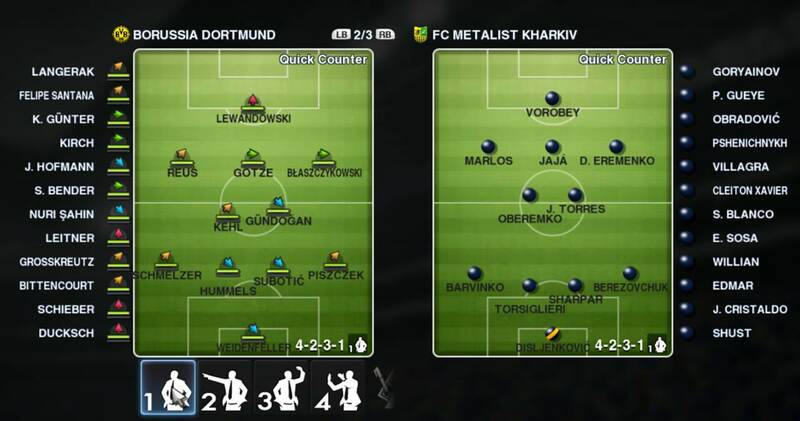 There is no derby matches in Master League Online, but your players’ arrow will improve after winning matches. Sometimes, we might notice a player who is on purple arrow for one match. The instinctive reaction is not to play him, until his form improves slightly. However, I find that this does not really form, as more often that not, the colour of the arrow will stay that way. If he is a star player and you wish to get him back into the team, the solution will be to put him in the substitute bench, and bring him into the game in the last 15 minutes, ideally after you have gained a comfortable lead. Yes, he will play poorly in the match, but giving him a runout in the match helps in improving his arrow for the next match. I have tried this a couple of times and find that this works well. No matter what the colours of the arrows are affected by, the Form rating in PES is definitely a key factor in the performance of a player. Form has been in place for a long time in PES, and there is no reason for a diminished influence. As a general rule of thumb, always aim to buy players with a form of 5 or above. This will help to ensure that players put in consistent performance match after match. Below, I have highlighted a starting lineup of 11 players with a high rating in form (7 or 8). They are not the best players for the position, as usually we cannot afford them, both in Master League Online or Master League. Rather, they are above average players available at a good price. Remarks: Possess Long Throw skill card. Remarks: Has an Attack and Defence of 3, and a Stamina of 95, making him the perfect candidate to run up and down the right flank. Remarks: At 188cm, he has the physical abilities to be a great defender. Remarks: Has the Lunging Tackle skill card. Remarks: Very good with both foot, and possess Early Cross and Step on Skills skill cards. Remarks: A great defensive midfielder with Anchor Man and Enforcer skill card. Remarks: A dependable midfielder with Roulette Skills, Double Touch, Lunging Tackle and Enforcer skill cards. Remarks: A box to box player and plays in 5 positions. Remarks: Has great ratings for many abilities despite a low 78 overall rating. Possess Free Roaming, One-Touch Play, Outside Curve, Turning Skills, Roulette Skills skill card. A good header of the ball too. Highly versatile. Remarks: Has top rating in form, and is highly versatile. Remarks: Strong attack ratings and shot accuracy. Possess 10 skill cards. And that is the on form starting line-up available at a good price. I hope you find this PES Form tutorial useful in ensuring your team performs consistently every match. Since before the patch someone on pesfan told me. Tested it off line and its true. Konami sometimes don’t explain stuff and leave it for people to find out themselves! Arrows don’t work like they used to, they only tell you the condition of a player meaning how quickly he will maintain his stamina or deplete it. The motivation/heart body colours are now the old way of using form. So players on orange or red will be higher, players on yellow-green medium, players with blue heads or on full blue will be low. For ages I picked players based on the arrows how it used to be, then I changed to motivation and my players played better now with good form. I now just ignore form arrows. I even pick purple players and only focus on motivation/heart. You can sub players with low arrows for stamina if you need to. but i think zed is ridht,, in my opinion, the striker with an average ability on shot accuracy is rarely shoot on target.. they always miss the target..